What is Common Test Platform (CTP)? Common Test Platform (CTP) is a quality management system that helps you manage your test processes more efficiently. CTP is also a collaborative platform to create and share Test Project Assets and maintain them in centralised data stores. CTP enables process owners to streamline and manage the whole range of test processes to ensure quality and timely deliveries. CTP brings in structure to testing projects by allowing users to define the Application Domain, Projects, Test Sets, Test Cases and to log Issues/Risks. What's more, the system also enables users to run tests and record evidence quickly and efficiently. CTP is a great asset in a manual test environment where the user executes Test Cases and records results on the intuitive interfaces available. In addition, CTP also facilitates the standardization of the test	processes and incorporation of industry best practices. 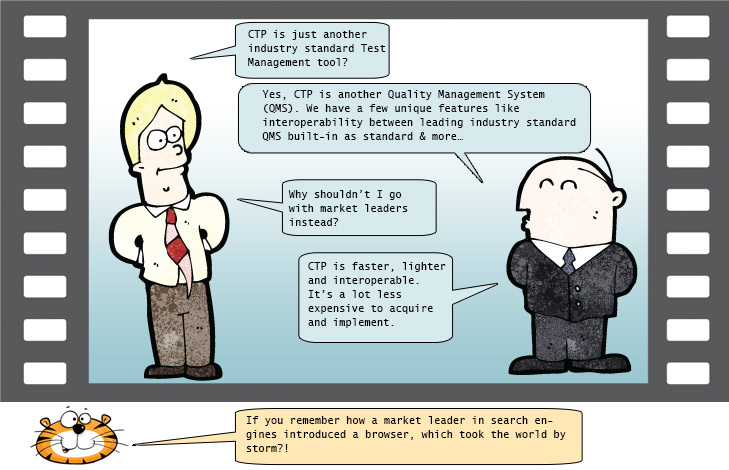 CTP works seamlessly with industry standard Functional Test Automation and Quality Management tools.